When they first started to use the right arm the whole arm bruised up. Both the surgeon and the kidney doctor looked at my arm and said it was up to me when I wanted them to take the port out? I said I wanted out so we took the chance and had it removed. Luckily after a couple weeks the bruising went down and during that time they were still able to stick the needles in the bruises and do my dialysis. I was worried about how much my bowling game would be affected now they use my right arm. So far there hasn’t been any bleeding issues. The bowling alley gets a little nervous but everything seems to be working okay. So the dialysis going good and the only other problem I have right now is my foot. The doctor has decided that I needed to lose weight. The first thing she did was take me off all my candy. This brought my sugar levels into the normal range but did very little for my weight. So after that she took me off bread. This work quite quickly at lowering my weight. I’ve been losing about a half a kilo week. It’s been a strange because now I still eat the turkey slices that I eat before but now they’re just rolled up. I still sneak in toast for breakfast and on occasional bun for a hamburger at night. Now with my foot, they had to come up with a cushion under my toes. The way my toes are bent when I walk has caused is a small hole to appear where one of my toes meet the floor. By putting a cushion under the toes it takes away some of the bend and the skin doesn’t break open. I been fighting this foot problem for about the last four years. We are not winning this battle but we are sit fighting it. I came home one day and showed my wife a bubble on my hybrid fistula graft. She looked at it and said it look like an infection. So we contacted my kidney doctor and told her what we saw. She immediately made an appointment for me to see the vascular surgeon the next day. 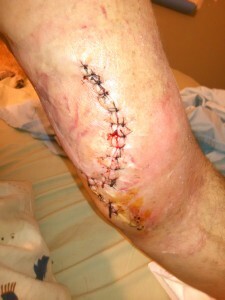 After the surgeon looked at it, he said we would treated it with antibiotics for 2 to 3 weeks. I went on with my day thinking that the matter was over. The surgeon called my kidney doctor to tell her the results. She reminded him that I was a liver transplant patient and that they couldn’t treat me for 2 to 3 weeks with antibiotics. So the kidney doctor call me back Thursday night and told me my surgery was scheduled for Monday morning. I immediately said what surgery? They said the old graft had to come out and they would put in a new one. They would also need to put in a port, so they could do dialysis while I healed. So Monday morning around 9 AM we showed up for my surgery. They finally took me in around 1:30 in the afternoon and ended up in recovery around 6:30 PM. They were able to go around the old graft with the new graft; pull out the old graft that the surgeon said had not wanted to come out; and get the port in. The next day I had to go to the foot doctor. The bandage on my arm had stains from the leakage of blood. 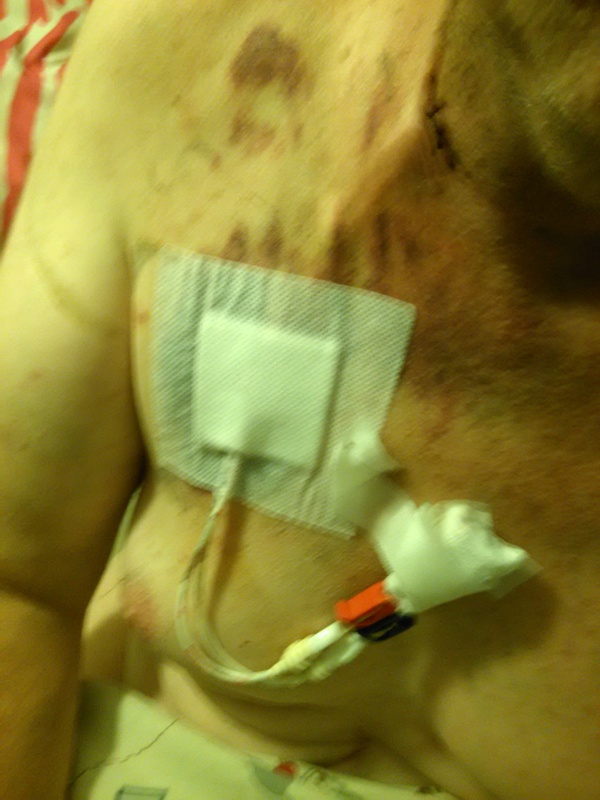 But the port in my chest was losing a little blood out of the bottom of the incision. I believe this is the quickest appointment I ever had with the foot doctor. He was great and put an additional bandage on my chest where the port was. From there I went back to the hospital where I had a appointment with my kidney doctor. The nurse saw where I was leaking and called for the surgeon to take a look. So before I saw my kidney doctor I had already been treated by the foot doctor and the vascular surgeon. Both of who bandaged me back up. Below are pictures of both the port and the graft. As you can see I have a lot of bruising but funny enough less then last time according to my wife. I am really looking forward to when they remove the port so they can remove the stitches in my neck that are holding the port’s internal tubing in place. I’ve had a small sore on my right leg for the last four years. With everything else settling down I was finally able to go to the dermatologist and have it checked out. This is about the sixth time I’ve been to the dermatologist to be checked out. This time he took a biopsy and determined it was a basal cell. When they find a basal cell they bring you into the office and do a procedure where they take off one layer of the sore and put it under a microscope and see if there’s any cells on the edge. If there are basal cells in the cut, they cut little more until they get all of it. This all started at the size of an erasure by the time they decided to do something with it was the size of a nickel. The size that they removed was about the size of a silver dollar. The sizable hole they left behind was too big to be sutured closed. So that means they have to do a skin graft to close the hole. They took the extra skin from the bottom of my right bicep. They say everybody has extra skin under their biceps. Until the graft took hold I would have to stay off my feet. This would take about 10 days. The biggest problem I had during this time was dialysis. During dialysis they keep a blood pressure cuff on you and take your blood pressure every 30 minutes. They can’t use my left arm because of the fistula, they can’t use my right arm because of the graft,they can’t use the right leg that’s where they put the graft. So all that was left was my left leg. My legs are not in the best condition and when they take blood pressure from your legs it is higher than when they take it from your arms. I also usually run a little high in the blood pressure department. After the 10 days they took off the bandages and determined that the graft was growing well. I thought this was going to be great and I was going to be all done and just let it finish healing but oh no. They are going to be sending out a nurse to change the bandages every couple of days. Then in about two weeks the doctor will take another look and reevaluate at that time. That means I can walk around and still bowl on days as long as I can get my foot with the bandage in a shoe. Now that the fistula is working properly it’s time to have the port removed. In some cases they do this in the office. In my case no procedure can be done in the office and must be done as an outpatient. So we went to the hospital where they told us they were running about 45 minutes late. If you ever been to the hospital before 45 minutes isn’t bad for waiting. They took me into the back room where they had me put on a gown and go over my medications and medical history. Then the next thing they have to do is start the I.V. in most cases this is done quite quickly. In my case the first nurse tried twice. The next nurse tried once. Then they called in the anesthesiologist he never misses. He tried once the arm and twice in the wrist then he gave up. They thought for a second maybe they would put an iv in my leg. Then they looked at my legs and remembered all the scar tissue and decided not to go there. Then they decided maybe they would go for the neck. Before they could do that the Doctor came in and said we don’t need the blood tests and really don’t need the IV. Instead he would give me a local and pull it out in the preop room. So he told the anesthesiologist to standby just in case and he did the procedure. The whole procedure took about 10 minutes. Since there is no anesthesia there was no real recovery time. My wife stayed in the room with me while this was going on so as soon as the procedure stop bleeding and they were able to put a little glue on top. I was able to go home. It’s time to try to use the fistula again. We start the same way we started the first time with both 17 needle. Then we’ll go to the 16 needle and finally the 15. Needles are based on resistance just like wires. So the larger the number the smaller the needle and the more resistance. Now my fistula is one third normal skin and two thirds under scar tissue. So far I’ve only been able to get them to stick the scar tissue twice. They only want to stick me into the skin that is thinner. The problem with that is the whole area is only about an inch and a half long. That’s a lot of sticks for such a small area. They say they will stick me wherever the surgeon marks my arm. Right now they been using the fistula for two weeks that’s a total of six sticks. They have missed twice. Every time they miss it makes a bruise about 3″ x 3″ on my bicep. On the two times that they have missed they used one needle in my arm and the other in the port. I was really hoping to get rid of the port so I would stop having this thing sticking out of my chest. Now I am thinking that I’ll try to keep the port in for a while longer. This will give me time for the bruises on my arm to heal a little. This also makes it easier for me to get out of dialysis because when they stick my arm I have to wait 20 minutes for the bleeding to stop. Usually I don’t mind the wait but I still have lots of appointments to make at the center that is 3 1/2 hours away. I have two more appointments at the dialysis center before I make it to the surgeon. When I make it to the surgeon he will make the final decision of where they can and can’t stick me. I had to start dialysis. I am lucky there are two dialysis centers in my area. There is one about 25 minutes away from home and the other which is about five minutes. Of course I had to start dialysis around the Fourth of July holiday and I got assigned to the one that was further away from my home with the promise that when an opening became available they would move me over to the closer one. If you get sick around the holiday you will find out that everything is not working like it should. It took longer to get me out of the hospital. It took longer to get my acceptance into a dialysis center so I could get out. This is how I got assigned the dialysis center further from home. They answered the phone while the other center didn’t and I wanted out of the hospital. Now that I’m on dialysis, my medicine schedule had to be changed. You would think this would be simple but it was very difficult for my wife to find out which medicines would stay in my system and which medicines would be pulled out of my system when I went on dialysis. At the hospital, they didn’t know so they would hold my medicines until after dialysis. It all depends on the size of the medicine molecules when it is in your system and whether or not it was too big to go through the dialysis filter. This became very important because the medicine I take for the arthritis I have to take after dialysis. I also have to take all vitamins after dialysis but my anti-rejection medicine I can take. I was patient for about a month waiting for them to reassign me. It’s was then I couldn’t wait anymore. It seemed that I just could not explain to them how much pain I was in for the 25 minute ride. So I called the other dialysis center and asked them if they have any openings. They said they had openings but only on third shift. I said great I’ll take it! Then I explained I was already at the other dialysis center. They said they couldn’t transfer me over and I have to wait for opening. So I brought my grievance up with the social worker and told her what happened. She agreed it wasn’t right and finally had me transferred over to the other center. Once I was over at the other dialysis center for about a month they did finally opened it up. For everybody. They were just waiting to go to a six-day schedule instead of a three-day schedule. So now they have some people come Monday,Wednesday and Friday and the rest of the people come Tuesday, Thursday and Saturday. My schedule is now at 5:30 in the morning on the Tuesday Thursday Saturday.That at least gives me the rest of the day to get other doctor appointments done.I have my wife drop me off in the morning. I’ve been told I have to be there at 5:15 so they can put me on the machine at 5:30. I’m lucky if one day a week the attendant is there before 5:30. My dialysis is for 3 1/2 hours so that I’m supposed to be disconnected at 9 o’clock. They have the next round of patients come in around 9:15. So when they put me on late in the morning and it’s time for me to come off in the very late morning or we are stacked on top of each other. When this happens, they pull my needles. While I’m holding them, waiting for the bleeding to stop. They put on the next patient. So if the next patient goes on easy I will only be holding for 10 or 15 minutes. If the patient doesn’t go on easy, I might be holding for 30 to 45 minutes. This might not seem like much but after sitting in a chair for 3 1/2 hours it can seem to take forever.